Choosing the right necklace is an important facet if you wish to shine at that party you have been invited to on Saturday eve. More importantly, the perfect necklace condescends the wearer’s neckline-it enhances your overall appearance. From short chokes to long regular opera necklaces, there are a plethora of designs available in the market to fit almost all types of necklines. Excluding rarities such as crew neck and polo neck, most other necklines require different styles to look enchanting. They require a little bit more insight and are generally more difficult to agree upon as it comes to picking the right necklace. The length of the necklace is important to match your attire and styling. 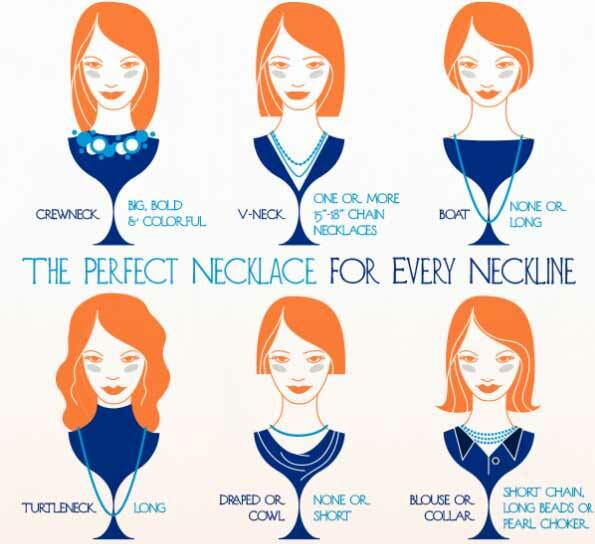 Understanding the different lengths of necklaces can help you discern as to which fits the neckline. Not all necklaces fit your neckline. There are quite different shapes of necklines when it comes to your fashion sense and attire. These include sweetheart, plunging, V-neck, scooped, round, crew and polo neck being a few of the prominent styles. Some necklaces are quite versatile, while others tend to fit solely one or two different dressing styles. This style is a wide one with the appropriate necklace making it look good, if worn the right way. Pendants made of large metal links that hug your chest and create and angular appearance fit this neckline. This style of clothing exposes much of the chest, neck and cleavage. You can choose to wear a simple yet delicate chain with an aesthetic solitaire pendant. This pendant enhances the chest and bosom and helps elongate the neck. If you prefer a more simplistic version, try a long neckline of chunky beads which can draw the attention away from your exposed parts. The necklace that is closer to your neck and is appropriate for your V-neck is the apt choice for this style. We recommend for selecting a pendant that ends somewhere below the neck/ mid-chest. The shorter it is, the more the necklace can draw attention from your chest to your face. Most of the necklaces tend to fit with this style. Large chunky necklaces and delicate pendants are suitable as long as they compliment the shape of the neckline. Once you decide on the style of the ornament chosen to fit the neckline of the attire. Consider the color, size and construction elements. If the necklace design attributes to size and recommends a long, hanging delicate chain be worn, but the top is plain, then a beautiful, well crafted stone or pendant and a delicate metallic chain can enhance the design of simple brilliance. Should it be a dull top, the necklace would largely be useless. In this case, a big yet simple beaded necklace of the same size and length is a better option. A dark attire is often better accompanied by a simpler lighter looking ornament.